Digital marketing is a fantastic way to drive leads to your business and create sales. The reality is, people spend twice as much time online as they used to 10 years ago. And while we say it a lot in our blog posts, the way people shop has changed drastically, meaning offline marketing isn’t as effective as it used to be. 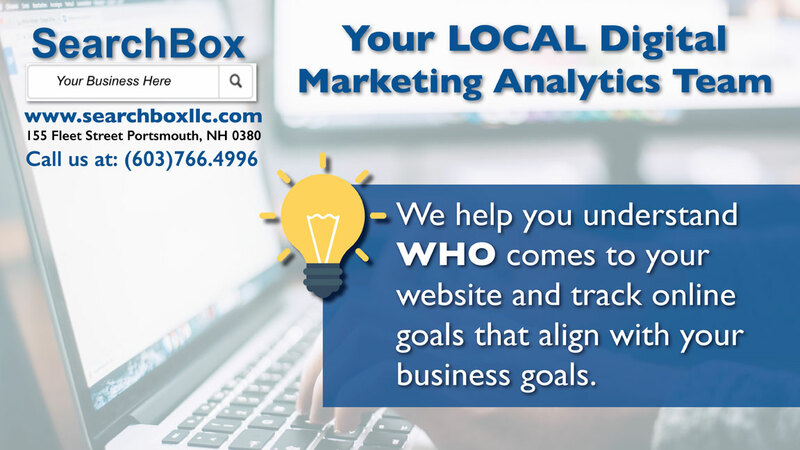 David Hadley, owner of SearchBox, a local marketing analytics team in Portsmouth, NH, lives this reality and has built his business around guiding clients toward their best digital marketing solutions. SearchBox can then guide clients to their most successful avenues for online advertising. Through this process, clients can discover who their target audience is so their return on their investment is always met and continually exceeded. What’s not to love? David and his team will completely take the guess work out of your marketing analytics so that you can focus on driving sales to your business. With detailed status reports that you can actually understand, SearchBox makes it easy to drive your business forward and take your success to another level.